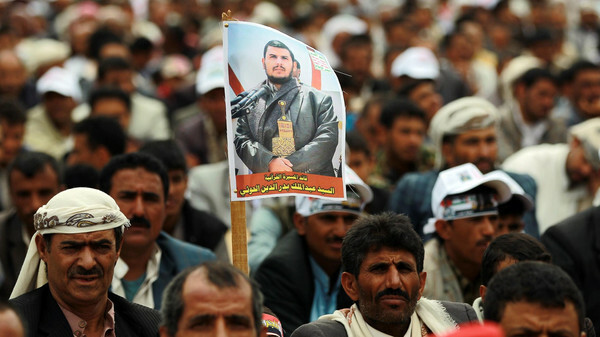 JNN 02 Sept 2014 Sanaa : Tens of thousands of Shiite Houthi activists demonstrated in the Yemeni capital Monday, heeding a call by their leader to press their campaign to oust the US & Saudi Backed Government , which is even Authenicated by the Western Puppet Organization United Nations. The show of strength by the Zaidi Shiite rebels caused traffic jams on several major roads in Sanaa, an AFP correspondent reported. The Shia Houthis, who have been fighting for years for more power for their Zaydi Shiite Muslim sect in north Yemen, have massed tens of thousands of supporters on the outskirts of the capital, Sanaa. Some have set up encampments in the city near the Interior Ministry. The Shia Houthis has been Protesting Since Long , and Due to their Protest the Dictatorial Rule of the Ex President Ali Abdullah Saleh’s Rule ended up in 2011 , Saleh was a Puppet of US and Saudi Monarchy , But as the Country is heavily under the US and Saudi Influence , so Saleh’s Rule was ended , but it was transferred to his Vice President , who is another Puppet of Old Allies Saudi and US , and Now as the Shia Houthis has raised their voice, and Protest , and have even Had armed conflicts with the State force , due to which the standoff has raised fears for the stability of Yemen, a U.S. ally and neighbor of major oil exporter Saudi Arabia. “The last phase mostly falls in the framework of civil disobedience … I direct my call to the residents of the capital and its outskirts to gather tomorrow morning in Change Square,” Houthi said in a televised address on a channel owned by the Houthis. The administration’s decision in July to raise fuel prices was part of efforts to rein in its budget deficit and helped the impoverished Arab state to conclude talks on a $560 million (337.3 million pounds) loan from the IMF. The Houthis have also pitched tents on a road leading to the airport near to key ministries. Their protests have tapped into wider public anger among Yemenis over the subsidy cuts. The General Yemeni Public and Shia Houthis in special has been Protesting and on demanding their Rights for a better Living , in shape of Fuel Subsidies , and right of Better Living Conditions , but in defiance to all these Problem , the UN is favoring the Planted US Government ,which is in their best interest . The UNITED Nation which should have been considerate of General Public Demand due to their Miseries because of inept , and Puppet Govt , which is already authoritatively trying to Crush a genuine Protest of the Poor People of Yemen. Rather trying to give it a sectarian look , which serves the US Interest . This entry was posted in Middle East and tagged Ali Abdullah Saleh, better Living, Protest, Sana'a, Saudi Backed Government, shia, Shia Houthis, Shiite Houthi, the State force, Western Puppet Organization United Nations, Yemen, yemeni capital. Bookmark the permalink.